The hotel is currently under renovations. Hotel's Great Location, whether you're in town for business or attending the Charlotte Convention Center or to enjoy Lake Norman, the hotel's central location in Huntersville, North Carolina off I-77 places you near the Huntersville Business District and area attractions such as Charlotte Motor Speedway, Davidson College and Concord Mills Outlet Mall.Charlotte is the place to be and home of the NASCAR Hall of Fame, Discovery Place and Bank of America Stadium. Guests looking for a low-key afternoon can shop at Northlake Mall or Birkdale Village, while the US National Whitewater Center is perfect for the hotel's more adventurous guests. Families in Huntersville, North Carolina love to visit Kid's Discovery Place, Carolina Raptor Center and EnergyExplorium.Corporate travelers looking for hotels in Huntersville, NC are pleased that we have fast and free Wi-FI access. We're central to area businesses, including Ingersoll Rand, Lowe's, Newell Rubbermaid, Duke Energy, Nabisco and GE Polymerland. 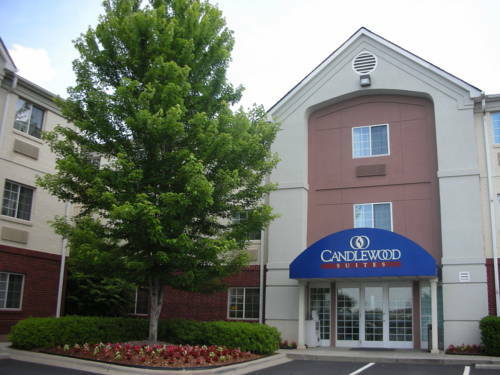 You can easily wind down after meetings with a round of golf at Birkdale, Northstone Country Club, Verdict Ridge or River Run.From the free guest laundry facility to the DVD/CD library in the hotel's lobby, the Candlewood Suites Huntersville, NC hotel feels like home. You can work out in the Fitness Center, pick up snacks and sundries from the Candlewood Cupboard, and then relax in an apartment-style suite. Come book your stay today! Outback Steakhouse: Boisterous Australian themed chain serving steaks, seafood and other hearty steakhouse fare. Bob Evans: American homestyle cuisine. Chilis Bar and Grill: American chain serving Tex Mex and American cuisine. Birkdale Golf ClubThis 18-hole Arnold Palmer designed Championship golf course has been voted the Best New Golf Course in North Carolina . Par 72 course made up of Bermuda fairways and Crenshaw Bent grass greens, offering a true test of golf skills. My Aloha Paddle and SurfMy Aloha Paddle and Surf, Inc. is the first of its kind in the Charlotte and Lake Norman area to offer Stand Up Paddle Fitness Programs, as well as Stand Up Paddle Board lessons by Certified WPA and PaddleFit Instructors.